In Fall 2015, Bata Library was the recipient of an extraordinarily generous gift of $1,000,000 from David and Joan Moore, to kick-start a transformational renewal project for the library. The Moores recognized that the Bata Library is highly used and valued by students, but it's in need of updates to support those students. This was the beginning of our Bata Library Transformation Project. This project will proceed slowly and carefully. We'll consider ways in which to maintain the original Ron Thom plan, while creating an enviroment in tune with modern academic libraries and the needs of current students. To keep our community up to date on how we're moving forward with this project, achievements will be posted here as we go along. We received some great feedback from everyone through our survey. Thank you for your input! The next step is to pull together all the information we've gathered. There will be a town hall meeting with the planners where you'll have another opportunity to comment on the plans. The date of the Town Hall is to be announced. An RFP was posted to hire space planning consultants to identify the needs and direction for Bata Library. A contract was awarded in Winter 2016, and a space plan should be completed by Summer 2016. Update February 2016: Perkins + Will was the firm selected for the space plan. During February and March they'll be gathering information from a variety of stakeholders - stay tuned for more details. This small instruction room on the Main (2nd) Floor will be renovated to create a more interactive teaching space. The new space will be used for instruction by three departments currently located in Bata Library: the Library, the Centre for Teaching & Learning, and Information Technology (IT). As a flexible, technologically advanced, and accessible room, it will serve as a proof-of-concept collaborative learning space. Features include wireless connection to wall display units, improved electrical access, and adaptable tables and chairs. It should be ready for use in March 2016. Part of the renovation involved moving the overnight book drop (for returning books when the library is closed) to an outdoor location at the bottom of the stairs, by the bus stop. The brass handle on the old book drop, designed by Ron Thom, is preserved in the Archives. When not used for teaching, the room will be available for student use. Update March 30, 2016: The Bata Library Collaborative Space BL 201 is now open for use by students, staff, librarians' and faculty! This room may be booked using the MyTrent Portal. A Steelcase media:scape table has been loaned to Bata Library for a few months, and groups of students have responded positively to it. These units allow groups to work collaboratively by connecting several laptops to a large screen. Equipped with power for multiple devices, they also increase the number of powered study seats available in a simple, safe and flexible way. 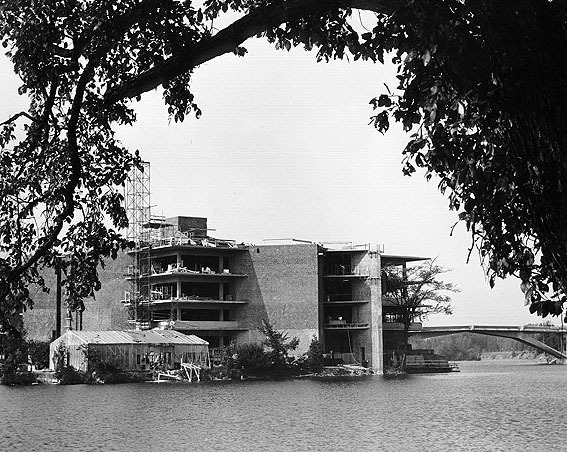 See more information and support the Bata Library Transformation Project.